Damp, leaky, and flooded basements are some of the most common problems that homeowners face. Due to their very nature and construction below the water table, basements are particularly prone to leaks and water damage. Regardless of whether your basement is concrete, stone, block or tile, it is important for every home owner to have at least a basic understanding of how to repair basement leaks. Only if your basement is well protected, will you feel comfortable and confident using it as a storage facility or even finishing and remodeling your basement with popular interior design concepts such as a game room layout, home theater space, office, work station, or even an additional bedroom area. Since popular basement renovation projects have been proven to significantly increase the value of a home, there is simply no point in forgoing these projects just because your basement is damp or leaky. By taking the time and initiative to learn how to repair basement leaks with a variety of simple, cost effective methods, you will then be free to transform your basement into a beautiful new living area, and increase your overall property value. Sealing or waterproofing the interior of a basement wall, using products such as Aqua Seal, Liquid Rubber, Stone Sealer, or even polyurethane or epoxy fillers, is the most simple and cost effective method for preventing water damage. Waterproofing and sealing will fill cracks and help to prevent moisture from entering through brick, stone, or even porous cement walls and floors. Unfortunately, neither waterproofing nor sealing are not long term solutions to moisture and water damage. While they may suffice for several months, a year, or more, these sealants will eventually begin to flake, peel and and blister. Typically, once water has entered the interior of a basement, it has already penetrated the foundation, and is under external pressure from the earth beyond your basement walls. Exterior Excavation is a much more costly and complex project than simple interior waterproofing. Excavation is typically accomplished with machines such as backhoes and excavators that can dig all the way down to the bottom of the foundation footing, around the circumference of the basement. For homeowners, this usually means that porches, landscaping, sidewalks, walkways, etc will be dug up and disrupted. Once the hole is dug, the exterior walls are coated with waterproofing membrane or material, and overlaid with protective drainage board. Typically, homeowners undertaking a major excavation project, will also use the opportunity to install new footing drains, and possibly even a sump pump. There are two types of footing drains: interior and exterior drains. Typically, exterior drains are only installed as part of an exterior excavation project. However, interior footing drains can be installed by jack-hammering a hole or trench though the basement floor. Next, a perforated pipe, and loose stone bed are installed into the hole to help pull water away. Finally, the floor may be concreted over again, or the hole may be left open if it in an inconspicuous place in a basement. While footing drains can prove helpful in reducing basement moisture, they can also clog over time, and will need to be regularly cleaned, unclogged or replaced. 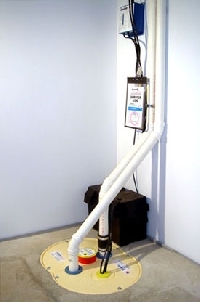 Sump pumps, designed to pump water out of damp basements, will work best when combined with basement drainage systems that will funnel accumulated water into a pit or basin. As water accumulates in a specific area a sump pump will automatically turn on, as it is wired into the home's electrical system and also has battery back-up. Early sump pumps were often smelly and unreliable systems, however, technology has improved vastly, and today's sump pumps are engineered with air tight covers, floor drains, check valves, clean stands and even built in alarms. Despite the improved quality of sump pump standards, mechanical repairs and regular maintenance will be required for any sump pump.